Blessed is the one who does not walk in step with the wicked or stand in the way that sinners take or sit in the company of the mockers, but whose delight is in the law of the LORD, and who meditates on his law day and night. Blessed is the one whom God corrects; so do not despise the discipline of the Almighty. For he wounds, but he also binds up; he injures, but his hands also heal. "Now listen! Today I am giving you a choice between life and death, between prosperity and disaster. For I command you this day to love the LORD your God and to keep his commands, decrees, and regulations by walking in his ways. If you do this, you will live and multiply, and the LORD you God will bless you and the land you are about to enter and occupy." Your basket and kneading bowl will be blessed. Your children and your crops will be blessed. The offspring of your herds and flocks will be blessed. 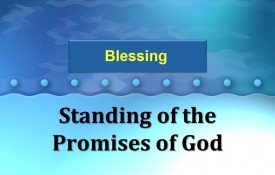 Oh yes - GOD, your God, will bless you just as he promised. You will lend to many nations but won't borrow from any; you'll rule over many nations but noe will rule over you.